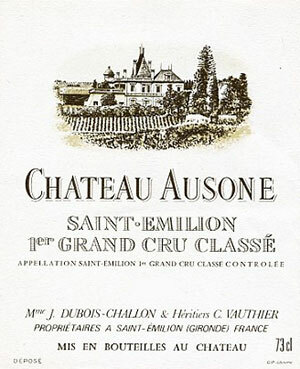 Readers should not hesitate to check out Ausone's new second wine, Chapelle d'Ausone. It reveals Ausone's minerality, finesse, and quality presented in a lower-keyed, more open-knit style. A deep garnet/ruby colour. The nose is magnificent with stunning delineation, black berries, and a hint of cooked meats, rosemary, espresso and graphite. Very complex and compelling. A touch of iodine and shellfish develops with time. The palate has an explosive entry on the palate, lots of dry extract, huge structure but with the acidity and the tension to keep everything in balance. A touch of black pepper towards the finish that suggest this wine is still very closed and would benefit from at least ten years further cellaring. Tasted March 2008.